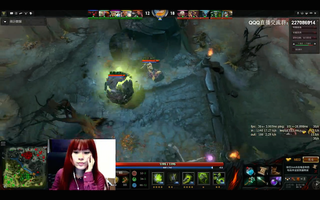 The video gaming live-streaming business is huge right now. Amazon purchased Twitch.TV for $970 million last year. Well, in the land where everything has a Chinese version, China, the Chinese equivalents of Twitch are in a legal war over the Dota 2 Asia Championships. Sina news reports that two of China's newest and fastest growing video game broadcasting sites, Huomao TV and Douyu TV, are at each other's proverbial throats over the rights to stream the upcoming Dota 2 Asia Championships. Huomao TV, which literally means Flaming Kitty TV, has an agreement with Perfect World, the operator of Dota 2 in China, to broadcast the Dota 2 Asia Championships. That is where the beef with Douyu is: Huomao says that Douyu is illegally broadcasting live streams of the tournament, stealing from the company and spreading false rumours that Douyu has an agreement with Perfect World. There's a reason why Huomao and Douyu are squabbling. Chinese streaming sites are big business right now, and so are e-sports. Both companies started last year, and while they're not behind on the movement, they're at a standstill with the likes of YY streams and the services found on Youku/Tudou. The various Chinese sites have also sunk money directly into e-sports through endorsement deals with teams and players and by directly operating teams. Douyu has their own Hearthstone team and former Chinese pro gamer Cao Mei is making bank by live-streaming on Zhanqi TV. So far there's no telling where this will go. The Dota 2 Asia Championships grand final is coming up in about two weeks' time!